These washer game rules apply specifically to washer boxes. Other rules apply to different washer games. Scoring is very simple, 1 point if your washer lands inside the box and 3 points if your washer lands inside the cup. If one of your washers lands on one of the edges of the box, you automatically win the game! Place the boxes where the cups are 21 feet apart. To determine who will pitch first, each player will toss one washer to the opposite cup. Whoever gets closest to the cup starts the game. This is called the diddle. Player A will toss their four washers, one at a time, to the opposite box followed by player B. The person or team who scored last throws first. Scoring is determined after both players/teams have tossed all of their washers. Only one player/team may score per round, but only scores points for all washers that are closer than their opponents. 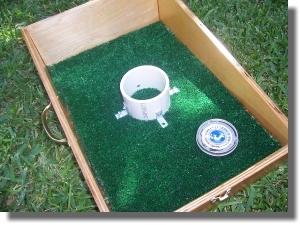 For example, if player A has 1 washer inside the box and player B has 3 washers inside the box, player B scores 2 points. The first player/team who scores 21 points wins the game. If player/team A reaches 21 points, and player/team B has yet to toss their washers, player/team B must be allowed to finish the round in hopes that they will nullify or make more points than team/player A. A skunk can be called at 11-0 or a whitewash can be called at 17-2.